I just got me a Brother MFC-1910W. It is a wireless laser printer with a scanner and a fax. 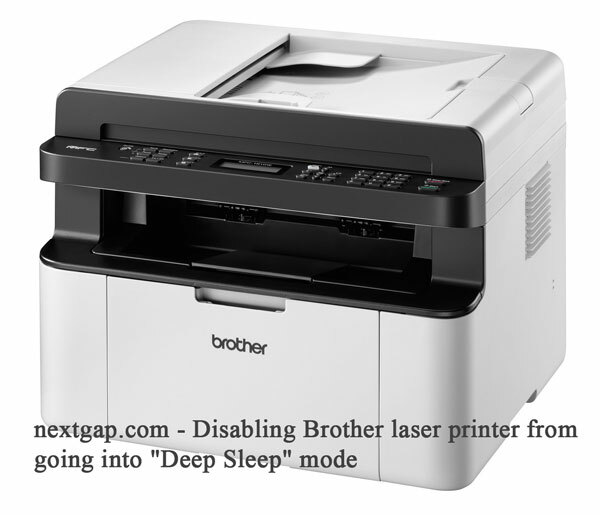 Shortly after installing the printer I noticed that it goes into a deep sleep mode and won’t wake up, even when trying to initiate a remote printing job. I could not cancel the deep sleep mode but only after I unplugged it from the electric socket. But, there is a better solution, which is a Java software, supplied by Brother, which enables you to set custom preferences for your Brother printer. The name of the software is Brother Remote Printer Console and it can be downloaded from the Brother web site. The software page is said to be for the HL-5440D, but it can be used for other models as well, like my MFC-1910W. The software requires you to have Java installed on your computer. Most likely you already have it installed. Once you install the Brother Remote Printer Console, open the console, and search for the “Custom” tab. In it, locate the “Sleep mode” and choose “NO” from the drop-down menu. Click the “Send” button to update your printer. Your printer will now stay on and awake 24/7 until you shut it off manually.